← Ketchup and mustard are staples of summer. It has been a couple years since I have done a column on hops and beer. Two things prompted me to do this today. First of all, as I drove from Genesee to William streets — and believe me, navigating Genesee Street these days is a whole lot more challenging than writing my column — I saw the fantastic mural being worked on, on the side of The Good Shepherds Brewing Co., the home of Sheps Beer. Congratulations to Garrett and Bob. I am sure that you will continue to fit right into the Auburn scene. The mural is going to be fantastic once completed. Secondly, I wanted to show my editor, David Wilcox, who writes wonderful columns about our favorite brews, that he is not the only one able to cover the beer beat. Before getting into that Auburn beer scene, I want to write about the hops themselves. Hops are normally a product of large farming operations that provide tons of them for the likes of Coors, Miller and Budweiser, but small hop farming has come into its own. Why? Because of the fantastic growth of microbreweries. They seem to be popping up everywhere. The new brewers are not afraid to try things that the big guys have always said will not work. The big guys brew beer in multi-thousand case lots. By comparison, the microbrewers deal in very small lots and serve loyal customers. So they can experiment with new ingredients and flavors. They just never seem to run out of new combinations for fruits and spices to please our palates. I’ve got to tell you, this dyed-in-the-wool wine drinker has been trying some new things. But I want to talk about hops. There are really only four basic ingredients in beer, beginning with water, yeast and malted barley. Stop there and you will have beer, but it will be pretty undrinkable. I guess you could get a pint down, but it wouldn’t be very close to what we are used to. It might even convince us to switch back to wine. From the earliest days, brewers flavored beer with just about anything that had a pleasant flavor, from heather flowers to herbs and spices. Today, and for the past couple hundred years, the additive of choice has been hops. This is a vining plant that will grow on ropes hung from huge telephone-like poles set at an angle in the ground. I am sure that many of us have seen the hop farm on the right side of Route 20 on a knoll between Auburn and Skaneateles. There is another very lush one on Route 34 near Lansing. I understand that there are nearly a dozen of them in the area. Certainly, there is another reason for breweries using hops grown close to home. It is the law: Breweries that have the New York state Farm Brewery License must use 20-percent New York-grown hops. So, everyone wins. Farmers get a new crop. Breweries have a lot of variety from which to choose. As with any food plant we grow, there will be different flavors in hops, depending on the soil it is grown in, which way the hillside faces and the water source, as well as fertilization. One thing that fascinates me about hops is the tedium of separating hundreds and hundreds of those little paper-like flower buds from their vines. I am sure that the “big guys” have machinery to do the job. But for a grower with a quarter-acre of poles, it has got to be tedious. 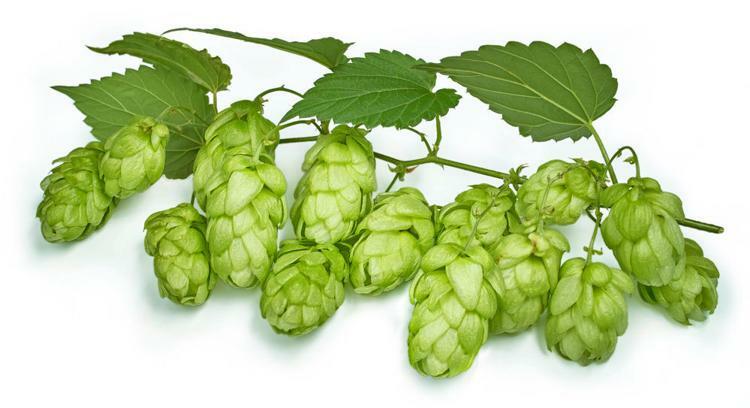 To answer that next question: Yes, you can grow a few hops at home for your own beer-making. It is as simple as hanging a few clotheslines from your eaves to the ground and buying some rhizomes and roots. Will the competition cause all these local breweries to crash and burn? Not really. While they all make beer, there is an ever-changing list of flavors and tastes at each endeavor. It would take a lifetime to enjoy them all. This entry was posted in Garden, Plants and tagged Cosentino Florist, Garden, horticultural, horticultural therapy, Plants. Bookmark the permalink.